I carry the sheets, warm from the dryer, up the stairs to the bedroom. Holding one edge of the sheet, and raising my arms high, I let the sheet fly upwards and billow like a cloud before it settles quietly on the bed. 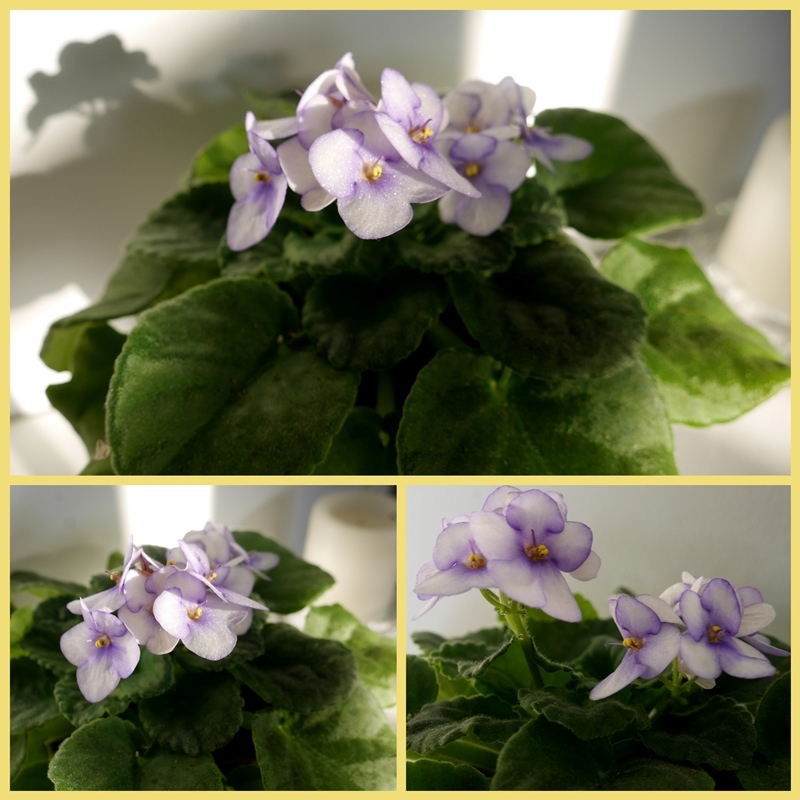 November bright sun surges through the window illuminating the African violet on the bookshelf. Crisp shadows, pale coloured flowers against rich green leaves. The sight was worth going downstairs for my camera. Outside, the brilliant leaves of late October and early November are fading into pale shadows of themselves, settling deeper into the earth. Gingko leaves curl into whorls of creamy yellow. Birds pick off the Hawthorne berries one by one, leaving open spaces among the branches. A few shriveled black berries are perhaps a reminder that the feast won't last indefinitely. On one hydrangea bush, the leaves and blossoms sing a duet of colour that will soon fade to palest brown. I've never noticed this colour on a leaf before, have you? Soon all the branches will be bare. Maybe snow will come, maybe not. We're having a mild November so far, with a rainy day or two following by a trio or more of glorious sunshine when there might be a little "ice in the bucket." I can't complain. I'd like to wish my American readers a very Happy Thanksgiving. We in Canada celebrated in October, but there's never a season to NOT be thankful, is there? Love your word description and how it opens up a visual image for me. I really was nodding my head while I read the poem by Coatsworth. Happy Monday and new week to you! Ahhhh...Elizabeth...pehaps you know that we in my corner have a special claim to her. I have yet to see the soft side of November. She’s been as wild as January some of the time, but I have heard of a warming trend. There have been Thanksgivings as warm as a September day, It’s been awhile 😏 Your description of flowers and sheets...lovely. I am there. Lorrie - isn't it interesting how something can catch our eye and inspire a post? Hmmm … I can smell the fresh sheets from here. Those delicate African violets - my Mother grows them, and not everyone can, so I concur that it was worth a trip downstairs for the picture! One of my geraniums turned lovely shades of red and purple as the frost worked its magic … thanks for bringing this autumn poem, and your delightful turn of phrase, to grace Mosaic Monday this week! I love the poem, have also red it online. Your African violet is a sweetie <3 Happy MM. lovely poem and beautiful series of photos. When I saw the title and beautiful photo....I knew this post was yours. It just sounded like you! Love the sweet poem. It's cooler here and I'm actually enjoying the dark coming early. I have extra candles that come on with timers and some twinkle lights. It feels cozy! Maybe I'll wash my sheets today! heehee! Enjoy your week! I love that poem. We are having a little bit of the soft and the hard side of November here in NC. Heavy days of rain then a week of sunshine and milder temps. My hydrangeas are amazing, brimming over with a strange mix of colours from deep red, brown to blues and purples. They change from week to week. Beautiful, my friend, both in writing and pictures. May you have a most blessed week! Hugs to you! You showed the 'soft side of November' so beautifully! Beautiful writing and pictures. It is very mild here too so I can relate to the soft side of November. Such beautiful photos and such beautiful days. Beautiful photos. November is snowy here this year. I love the way you captured your African violet. So very soft and pretty. Enjoyed all the photos, that lovely poem and your musings as you go about your day. I agree that we should be thankful every day. We had our first significant snowfall (5-10 cm) last Thursday. But the snow melted pretty quickly. Oh...beautiful prose and beautiful photographs. I feel as if I've read a long letter from a dear friend. I love when the light shines just so and you are inspired to find your camera. My daughter and my nana both have good luck with African violets but mine have never lasted. ...Lorrie, these details of nature are what I enjoy. Alway slow down and appreciate your surroundings. I feel I'm reading a good book, and I think it's not the first time this happens when I'm reading your posts. We too are grateful for the soft and peaceful November days. How beautifully you illustrate the poem...and your own November thoughts. I've enjoyed reading your words and seeing your photos. You evoke calm in my heart. Thank you. Your photos are lovely, Lorrie, and those berries are so pretty! There are no signs of berries around here because winter has come early this year. We got a lot of snow last week which never melted and we are getting 10-15 cm more tonight. It's been so cold too. More and more, I think I should be living down South! :-) I have to admit however when the sun comes out after a snow storm, the world outside my window is a beautiful place. Thank you for your lovely post. It's beautiful how you take note of your surroundings. Such beautiful words and pictures..